The MIT community is invited to an open forum with the Ad Hoc Task Force on Open Access to MIT’s Research. Share your feedback on the draft recommendations recently released by the task force. In 2017, Provost Martin Schmidt charged an Institute-wide task force with identifying ways in which MIT’s current open access policies and practices might be updated and revised. Over 18 months, the task force gathered input from experts across campus and beyond to better understand local, national, and global practices and policies related to open access.The recommendations include ratifying an Institute-wide set of principles for open science; broadening the faculty OA policy to cover all MIT authors; adopting an OA policy for monographs; and asking department heads to develop discipline-specific plans to encourage and support open sharing. 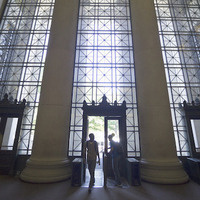 The MIT community can also submit feedback via the task force idea bank, on the open publishing platform PubPub, or via email to the task force.